General information: Newly refurbed, not as dingy as it was. 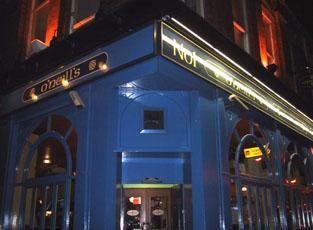 Have recently moved to the area and find O'Niells a great place for a quiet pint or a big night out. Band nights are really good and tend to be busy - some good bands on - saw a band called Prime Suspects on Bank Holiday weekend and they where fantastic. Bar staff really friendly and generally good atmoshere in the pub. Only down side is it can gety a little hot and the toilets aren't the best. Pretty cool pub, i got a cheap pint of Grolsch on one particular evening which pleased me, i'd recommend O'Neills wholeheartedly. A good pub with a good atmosphere. Lots of footie, big food portions and table service from quite possibly the most gorgeous barmaid in Didsbury! Can't remember her name but she is asian looking with a killer smile....I want to marry her! This is actually one of my favourite pubs in Didsbury!! Granted you often have to stand up, but the excellent bar staff make up for that, they are always efficient and there is often table service which is good!! The live bands could be better but still the atmosphere is always great! !